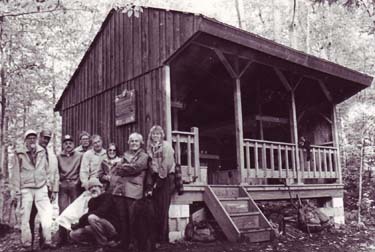 Top: Bear Hollow Shelter with Sterling Section members posing proudly. 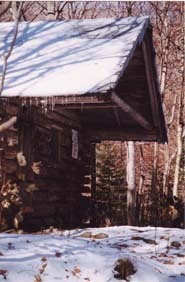 Third: Beaver Meadow Lodge in winter. 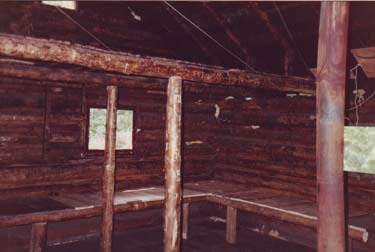 Bottom: Worn wooden interior of Beaver Meadow Lodge. The Sterling Section maintains three primitive camping shelters. Bear Hollow and Whiteface are rustic, three sided "adirondack style" lean-tos, and Beaver Meadow Lodge is a small log cabin. Together with the shelters on the rest of the Long Trail, they form a chain of backcountry campsites each placed a moderate days hike apart that stretch the entire length of the Green Mountains. Sleeping in the shelters, and using the outhouses, is one of the best things you can do to "leave no trace" when camping in the Sterling Section. In the grand scheme of things, this backcountry area is relatively small compared to the number of people who visit it each year. If all of them searched out a campsite in the woods there would be an ugly "blast zone" of impacted areas spreading out from the trails. Instead, most people stay at the shelters and when they hike on in the morning they leave the forest as they found it for the next person to enjoy. And besides all that, there is a timeless charm to these old Vermont camps, with their logs hand hewn and long ago worn smooth. 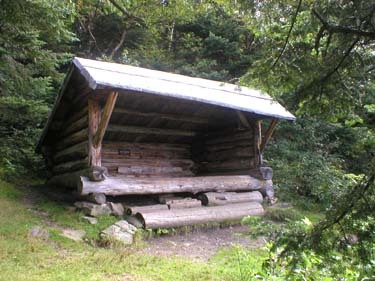 Each shelter is located near a stream for water. Of course, the GMC cannot guarantee the quantity and quality of water flowing at any given time, such as in a drought. And we strongly recommend hikers learn how to properly treat, filter or boil all drinking water to remove possible waterborne illnesses such as Giardia. Two of the shelters have fire circles for small campfires. Fires are not allowed at Whiteface Shelter in order to minimize impact on the fragile high elevation forest there. Important note for large groups such as schools, camps, scout troops and so on . . . Please contact the Green Mountain Club main office before heading out; and talk with the GMC's "Group Outreach Coordinator." They can help you plan your trip and coordinate it with the trips planned by other large groups so that you don't accidentally arrive at a campsite that is already filled. In general, it seems to work best when large groups plan to use tents rather than stay inside the shelters (so as to avoid filling up an entire shelter in one fell swoop). In the Sterling Section, Beaver Meadow and Bear Hollow each have tenting areas that can accomodate a group. Organizations planning trips on the State Forest may also need a "special use permit" from the Vermont Department of Forests, Parks and Recreation. Contact the Barre office of "FPR" at 802-476-0170 for more information. There is nothing quite like it when you have hiked all day, and finished your pan of noodles and mush, and you pull the sleeping bag up to your chin, and look out the front of the shelter across the valley, as it gets just dark enough for stars to emerge one by one and then by thousands, and in the distance, a plaintive cry - is it the Wampahoofus?